By Hugo Van Der Goes. This altarpiece by Hugo Van Der Goes, one of the treasures of Northern Renaissance art, ranks alongside the finest religious art of the 15th century by Flemish painters such as Broederlam (1350-1411), Robert Campin (Master of Flemalle) (c.1378-1444), Hubert and Jan van Eyck (1390-1441), Roger Van der Weyden (1400-1464), Dieric Bouts the Elder (1420-75), and Hans Memling (c.1433-94). Also known as the Portinari Triptych, it represents the Adoration of the Shepherds and the Holy Family according to the Biblical story in Luke (2:10-19). Painted in Bruges then shipped to Florence, the panel paintings had a significant impact on Renaissance art in the city and beyond, including the Umbrian School of painting, as well as manuscript illustration. Sadly, within a short time of completing this masterpiece, Hugo Van Der Goes suffered a complete mental breakdown. In 1482, a year before the painting was even installed, he died. The work - now seen as one of the most influential works of Christian art of the 15th century - resides in the Uffizi Gallery, Florence. The Portinari Altarpiece was commissioned by the Italian financier Tommaso Portinari, a long-term resident of the important Flemish trading centre of Bruges, where he was the manager of the Bruges branch of the Medici Family Bank. Intended to commemorate his success in Flanders, the triptych was to be installed on the high altar of St Egidio, the church of the hospital of Santa Maria Nuova in Florence, the Portinari family chapel, which had been founded in 1288 by Folco Portinari, one of Tommaso's ancestors. Exactly why he chose the Ghent painter Hugo van der Goes to paint the work remains unclear: very little is known of his life before 1467 when he became a master craftsman in the local Guild of Painters at the age of 27. After this, he was awarded some minor commissions by the town of Ghent, and in 1475 he became Dean of the Guild. Whatever his previous accomplishments, Van der Goes produced a masterpiece of Flemish painting which was not only an appropriately grandiose tribute to Portinari, but also a highly personal vision of the Nativity, possibly inspired by the visions of Saint Bridget of Sweden. Finished about 1479, the panel paintings were transported by boat to Sicily and afterwards by barge to Porta San Frediano in Florence, arriving in May 1483. The central scene celebrates the joy at the birth of Jesus, but also highlights the humility of the family and the peasants. Three realistic figures of shepherds are kneeling before the Christ child, who - most unusually - is not lying in a crib, but on the ground, surrounded by golden light. (For another naturalistic portrayal of the shepherds, see Adoration of the Shepherds [Metropolitan Museum of Art, New York] by the precocious Andrea Mantegna.) For his figures, Van der Goes introduces an old-fashioned hierarchy of scale: the Holy Family are given the largest dimensions, while angels and donors are smaller. The figures are arranged according to diagonal axes around the Virgin Mary, whose hands form the centre of the painting. This unusual arrangement produces a rather unbalanced sense of movement. In the foreground, the exquisite still life - consisting of two vases of flowers and a sheaf of wheat - is a reference to the Eucharist and the Passion. The wheat alludes to the Last Supper, when Jesus broke the bread. The vine leaves and grapes on the vase relate to the wine. The white irises symbolize purity, while the orange lilies refer to the Passion (the red carnations symbolize to the bloodied nails of Christ's cross); the purple irises and columbine stalks represent the seven sorrows of the Virgin Mary. Thus, taken as a whole, this scene of Christ's Nativity prefigures the later Salvation which he achieves through his death. On the side panels, kneeling donors are flanked by their patron saints. Portinari, for instance, is shown on the left panel together with his two sons Antonio and Pigello. Opposite, on the right panel, his wife Maria di Francesco Baroncelli is portrayed together with their daughter Margarita. All the donors, with the exception of Pigello, are shown along with their patron saints: Saint Thomas (with spear), Saint Anthony (with bell), Mary Magdalen (with ointment) and Saint Margaret (with book and dragon). The background of the triptych is painted with scenes related to the main theme. Thus on the left, we see Joseph fleeing to Egypt with his pregnant wife; in the central panel, the shepherds are visited by the angel; and on the right, the Three Magi are shown on their way to Bethlehem. When the two side panels are closed, we see a view of The Annunciation, with the two figures - the Virgin of the Annunciation and the Archangel Gabriel - painted entirely in monochrome grisaille technique. The enormous figures, deceivingly rendered to resemble stone sculptures (hence the grisaille), are seemingly inset into their own austere arched recesses, and swathed in thick, flowing robes. The entire trompe l'oeil effect was something quite unknown in Renaissance art in Florence, and many Italian painters sought to imitate its meticulous naturalism. See for example the Adoration of the Shepherds (1485, Sassetti Chapel, Santa Trinita, Florence) by Domenico Ghirlandaio. The Portinari Altarpiece is regarded as one of the greatest Renaissance paintings, not least because of these revolutionary features. (1) To begin with, Van der Goes did not group the main figures around a centralized focal point, but took the unique decision to arrange them according to a diagonal scheme. The resulting tension was further heightened by the chiaroscuro effects and expressive movements of the figures. 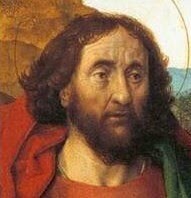 (2) Second, he was the first artist to include authentic, ugly or at least non-idealized, 'peasant types' in his painting, on an equal footing with the saints before God. In most depictions of the Adoration, the shepherds and Magi worship Jesus all together. In contrast, Van der Goes gives special prominence to the shepherds, and portrays their faces with character and individuality - in sharp contrast to the conventional idealized features of many other participants. - Dijon Altarpiece (1393-99) by Melchior Broederlam. - Seilern (Entombment) Triptych (1410) by Robert Campin/Master of Flemalle. - Merode Altarpiece (1427) by Robert Campin. - The Ghent Altarpiece (1432) by Hubert/Jan van Eyck. - Descent From the Cross (1435-40) by Roger Van der Weyden. - The Last Judgment (c.1450) by Roger Van der Weyden. - The Last Supper (1464-8) by Dieric Bouts the Elder. - Last Judgment Triptych (c.1471) by Hans Memling. - Donne Triptych (1477-80) by Hans Memling.  For analysis of other key works, see: Famous Paintings Analyzed.  For more about Flemish painting, see our main index: Homepage.